Friday Tip of the Day w/Miss Debbie Crowder! 3-D Wednesday w/ Miss Cassandra! *** This challenge is a BUG'S THEME CHALLENGE! Use any older cartridge of YOUR choice & create a project of YOUR choice using a "BUG" theme! *** Link your project up to Mr. Linky below, then leave a comment! *** Deadline for this challenge will be on Wed, Feb 15th @ midnight! Okay, now onto my AWESOME design team! Don't forget to click on their names to visit their blogs! used "More Gift Card Sentiments" along w/my "Gift Card Holder" die! used "Wow So Many Candles" stamp set! used "This & That" stamp set! used "My Favorite Sayings" stamp set! used "Many Greetings" stamp stamp set! used "Classy & Fabulous" stamp set! 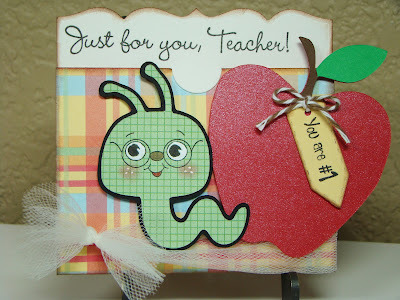 used "My Favorite Sayings" stamp set along w/"Build A Banner Kit"! Okay, now onto the lucky winner from last throwback challenge..."Valentine Theme"! Love the embossing. Very pretty. Everyone did such a great job! I am going to try and create something for this challenge (fingers crossed). I just laughed at myself and I watched your video. I seriously didn't know that you can just use the arrow to move up my card base to make it even, LOL. I also just moved it that's why I could never even it up. I always learn something from you my friend. Can't wait for the new release and wonderful inspirations from all the DT. Such ADORABLE cards from everybody! 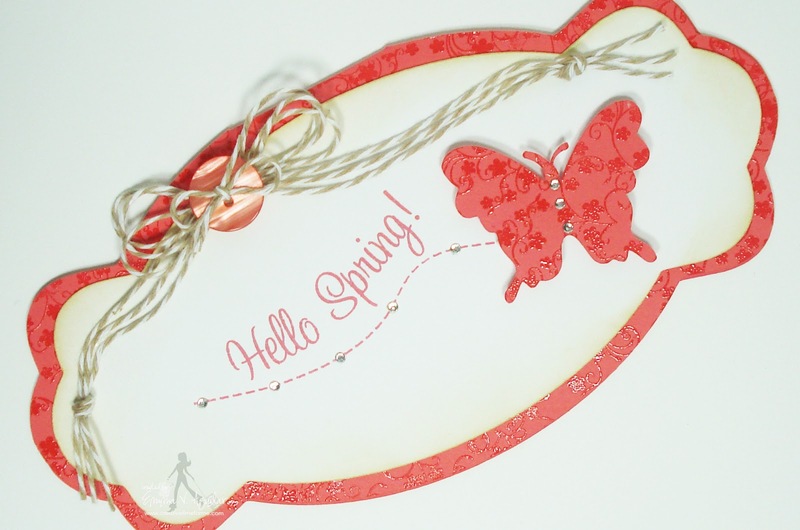 Emma, I love how you curved your stitching stamp to make the trail for the butterfly. Brilliant! The embossing looks just gorgeous!!! 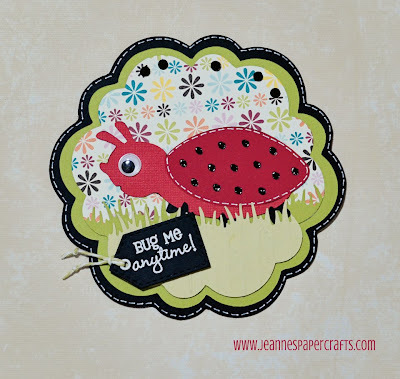 Such super cute "bug" projects! Love that shape you used for the base Emma, it's perfect! Oh my goodness Emma! this is beautiful! I can't believe I forgot about the stitching line!!! oh my!!!!!! all these projects are sooooo cute!!! BEAUTIFUL ~ just beautiful! I love the shape of this card! It fits so PERFECTLY with the butterfly flying with the stitching!I just love watching the videos ~ you really teach me so much! I think ALL the Dt's did an AMAZING job! So funny you mentioned the subscribe thing ~ some of the blogs I subscribe too stopped! As always LOVE it! What great projects! Everyone is so talented! Looking forward to seeing your new release. i am so sad you aren't showing up on my blog.. not even in google reader.. wonder if anyone else is having this problem besides me? HUH I didn't notice that the whole blog thing was happening... I think its just cause I GO TO YOUR BLOG EVERYDAY! lol... I'll have to get on that. I was wondering why I wasn't getting anything about your new posts!! I tried to resubscribe but it said that I was already subscribing. But I'm not getting notified about your news posts. Don't know what is going on, but I noticed that I missed out on a lot! I guess I'd just better start checking everyday!! I love your butterfly card, so cute. The DT did a great job as well, I'm always so impressed by what they do!! I love the end result. You added some inking around the edge, more embossing, a button and some twine. The card turned out so cute. I have to have that cartridge.......I am sure it's a need and not a want. Such perfect projects! Love them all! All the little details make this simple card special. The embossing, the twine and the button just finish it. Your so creative. So glad I discovered your blog. Thanks Emma for the inspiration. Fun Challenge and love all the creativeness. 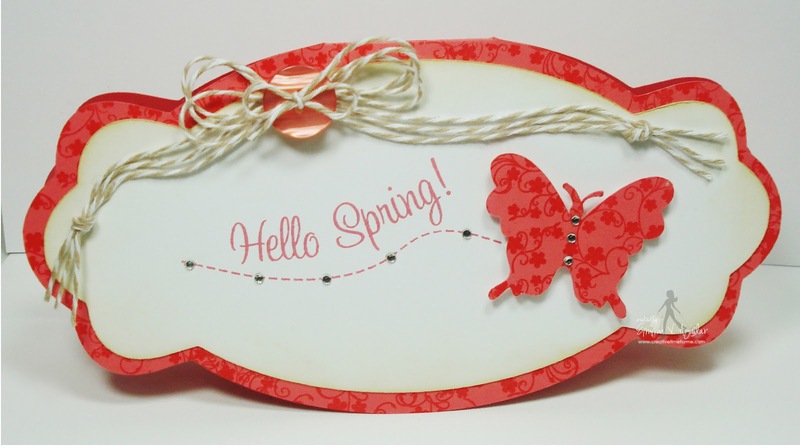 The background stamped and embossed flowers looks wonderful...I wish I dreamed about making great cards. Your Design Team also did a great job with all their projects. What a great idea. I love how the ribbon coordinates perfectly. Itty bitty flowers are a favorite of mine. really cute, I love what u did with the twine and the DT did great. Provo craft sent back my Gypsy and I'll get it today, so I cant wait to join in on this challenge. Super cute, I can't wait to see your new release. DT great projects, thanks for the inspiration. I am so going to try to join the challenge. So now I did my card and linked it. My day is complete. I crafted something fun and beautiful. All the projects look fabulous!! I love learning new things from you Emma! Because I still have the little 12 x 6 Cricut, I always need to do my matting on another layer on my Gypsy and I could never figure out how to copy one shape from layer to layer. Thanks for teaching me, Emma! Your card is FAB! Simple and Adorable. My favorite! I am so excited this is the first time I have entered a challenge it was so much fun!! I love all of your products!! I just entered my project. This is my first entry in one of your challenges. Just posted it . . . hope the picture is not too blurry. BTW, I think this is my favorite card ever!!! Thanks for the chance. Great job Emma and also your design team. Looking forward to your release. This was so much fun Emma, thanks for the chance to win. Can't wait to see those new stamps my friend! Fun challenge. Thanks for the inspiration, Design Team! Oh my goodness, this may be my favorite.... I've been embossing using the script type backgrounds stamp like crazy! I LOVE IT so much!!! Beautiful projects!! Thank you for the fun and for the chance to win!!! Thank you for a fun challenge. The DT did a great job. I ditto Scrappin Chick! I am always so exited for your challenges! You and your DT are super de duper! I left a little "Bug" behind to share with you:) See you Friday AM bright eyed and bushy tailed! 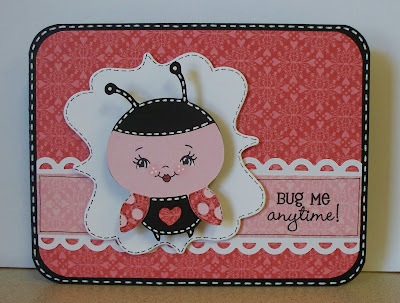 Happy Valentines Day to you and your family, Debbie H.
Adorable bug projects by everyone...I love everyone of them! Awesome job to Emma and her DT!! Great DT! Thanks for the fun challenge! I am so excited about all your new stamps coming out this week. Thanks for another great challenge. These little critters are so cute!! 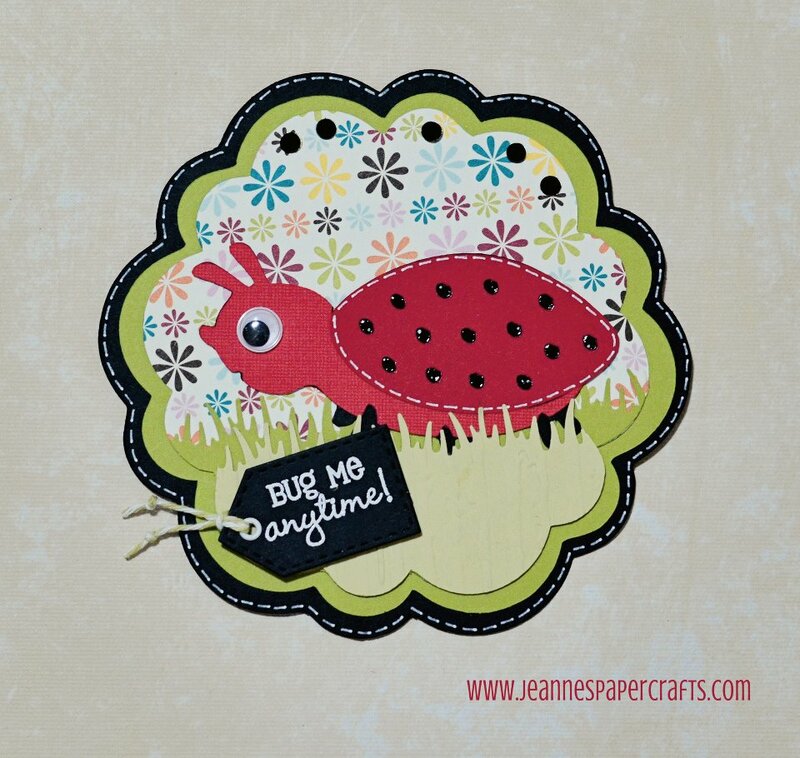 Love the "Bug me anytime" sentiment. Thanks for the inspiration and fun challenge! A Valentine's Day Card I made for my Husband...I found the bug on the Create A Critter Cartridge along with the phrase...I also used a stamp from the 100% Sweetness set. I had so much fun creating this although the photo didn't turn out too well. I got to use my new MCT stamps and die. I loved all the DT projects. Everyone is so creative. I'm entering a project for the first time. can't wait for the stamp release. All of the projects are amazing, as usual! Thanks for hosting such a fun challenge - I've always enjoyed Throwback Thursday! Your card is sooo cute. I had a fun time making the card for this challenge and I love the way it turned out. Thanks for the inspiration. I had the most fun with this challenge! I really enjoyed making my project and my husband loved the results. Thanks for allowing me to participate. Happy Valentine's Day. I have always enjoyed looking at your throwback Thursdays! 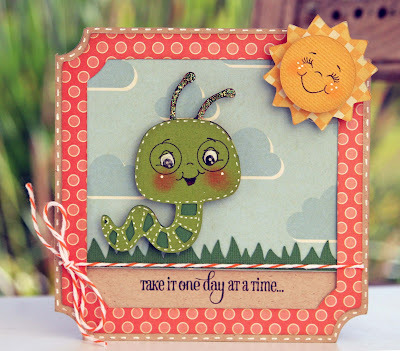 I just linked my bug card for this challenge! It's my first time doing this!! so excited! thanks for the chance to win the entire release!! it looks amazing!! Peace, Love, & Cricut Hug's ! Excited for another Throwback Thursday. Awesome challenge Emma! I had a blast pulling out my old stuff and getting reunited with all it!